Pension Fund Systems are concerning us, and our future generations. The largest pension funds are in the USA and Japan. Switzerland represents comparatively an important part of the cake. 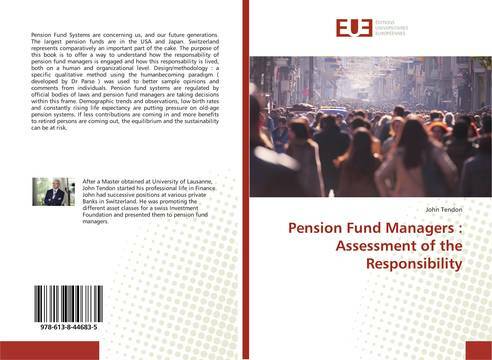 The purpose of this book is to offer a way to understand how the responsability of pension fund managers is engaged and how this responsability is lived, both on a human and organizational level. Design/methodology : a specific qualitative method using the humanbecoming paradigm ( developed by Dr Parse ) was used to better sample opinions and comments from individuals. Pension fund systems are regulated by official bodies of laws and pension fund managers are taking decisions within this frame. Demographic trends and observations, low birth rates and constantly rising life expectancy are putting pressure on old-age pension systems. If less contributions are coming in and more benefits to retired persons are coming out, the equilibrium and the sustainability can be at risk. Being responsible, Pension fund governance, Socially Responsible Investment, alternative investments for pension funds, humanbecoming theoretical perspective, qualitative descriptive exploratory study.